Weifeng Xu was born and raised in the northeastern part of China, and is the daughter of architectural engineers. She went to Peking University for her undergraduate education, major in Biophysics and Physiology in the College of Life Sciences. Weifeng Xu did her Ph.D study with Dr. Diane Lipscombe in the Neuroscience Graduate Program at Brown University. Weifeng did her postdoctoral training with Dr. Robert Malenka at Stanford University School of Medicine. For her doctoral thesis, she studied the biophysical and pharmacological properties of L-type voltage-gated calcium channels, a type of calcium channels involved in membrane excitation-gene expression coupling and other functions in neurons. She found novel properties of a sub-class of the L-type calcium channels, with a broader activation regime and lower sensitivity to classical L-type calcium channel blockers. These findings suggest significant contribution of these channels in neuronal function in subthreshold membrane potential regime and underestimation of these channels contribution using traditional pharmacological blockade. Since then, many research groups have found that this sub-class of calcium channels play an important role in regulating neuronal firing and mediating calcium influx in different types of neurons in many brain regions. 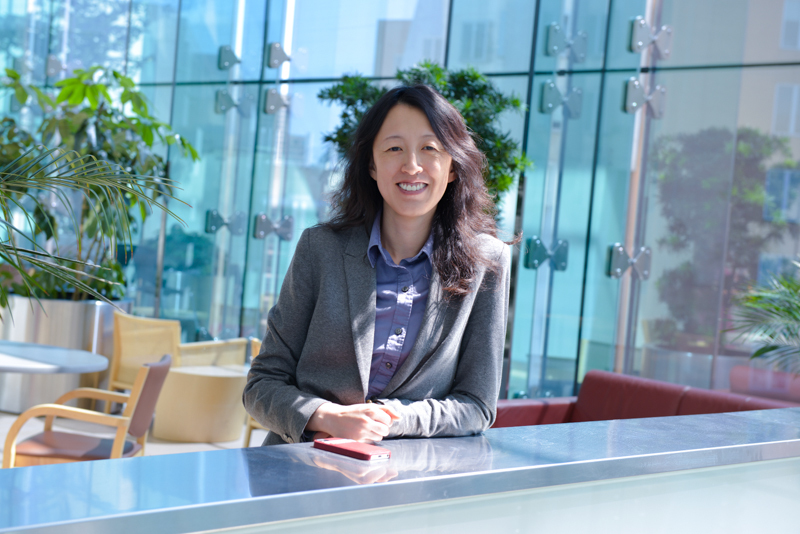 After graduation, Weifeng went to Stanford University to continue her postdoctoral training with Dr. Robert Malenka, a world-renowned synaptic physiologist. In a collaborative effort, Weifeng and another researcher, Dr. Oliver Schluter, developed the molecular replacement system that allows to knockdown the expression of an endogenous gene while simultaneously expressing exogenous proteins of interest, using a virus-mediated gene transfer system. Using this system, they studied a neuronal protein PSD-95, an abundant protein in the postsynaptic density of the excitatory glutamatergic synapse, and identified specific functional domains in PSD-95 in regulating synaptic strength and mediating activity-dependent changes of synaptic strength, i.e. synaptic plasticity. They established that PSD-95 is not only a structural component of the postsynaptic density, but also a scaffold for signaling complex critical for the expression of a form of synaptic plasticity, long-term depression (LTD). Their studies suggest that different family members of PSD-95 family proteins exert different function due to the diversity in their protein structure. This structural diversity allows potential different signaling complex formation, thereby determines the functional diversity at synapses, and the differential expression mechanism of synaptic plasticity. Our goal is to understand mechanisms of neural plasticity essential for information processing and storage in the brain and their dysfunction in diseases such as autism, schizophrenia, bipolar disorder and mental retardation. We are interested in understanding how signaling scaffolds in the postsynaptic compartment of neurons organize and orchestrate signaling events that lead to the expression of synaptic plasticity important for learning and memory. We are also interested in understanding how regulating calcium homeostasis via activity-dependent mechanisms modulates synaptic plasticity and neuronal excitability; consequently modulate animals’ learning ability.